Resistor Color Code Calculator The following is an introduction to how resistors work. 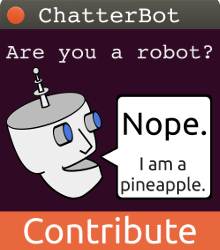 This is a post in a series I am writing titled 'Introduction to Electronics. In these posts you fill find necessary tool for using electronic components like resistors. The two main characteristics of resistors are resistance (R) measured in ohms, and power rating (W) measured in watts. The resistance value of a resistor can range from a fraction of an ohm to many megohms. A fixed resistor supplies a predetermined resistance to a circuit. The standard unit value of a resistor is the ohm (represented by the symbol Ω usually with the prefix "K" or "M"; "K" meaning thousand and "M" meaning million. The higher the ohm value, the more resistance the component provides to the circuit. 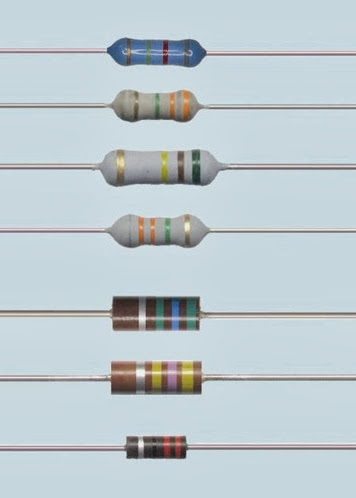 The value on most fixed resistors is identified by color coding. The color coding starts near the edge of the resistor and comprises four, five, and sometimes six band colors. 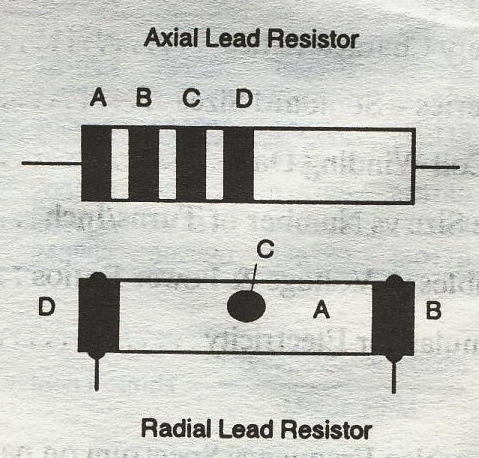 Additional information concerning the Axial Lead resistor can be obtained if the first band is a wide band. (Case 1) if only the first band is wide than the resistor is wire wound. (Case 2) if the first band is wide and there is also a blue fifth band to the right of the fourth band than the resistor is wirewound and flame proof. Variable resistors, also known as potentiometers (pots) let you adjust a resistor to a specific resistance. The actual range of resistance is determined by the upward value of the potentiometer. Potentiometers are thus marked with this upward value, such as 10K, 50K, 100K, 1M, and so forth. Potentiometers are either the dial or slide type. The rotation of the dial type is nearly 360°, depending on the type of potentiometer. Extremely precise potentiometers are referred to as multiturn pots or trimmers. Instead of of turning the dial one complete rotation to change the resistance, a multiturn pot requires that the dial is turned 3, 5, 10, or even 15 times for the span to be the same as a regular potentiometer.